What if You Missed the First 20 Years of Saving for Retirement? A lot has been written about the dismal circumstances of many American baby boomers who are not financially prepared for retirement. A recent study done by the National Institute on Retirement Security found that the median retirement saving balance for American households’ ages 55 – 64 is just USD12, 000 (about RM38, 000). Now that is definitely a scary number. If you are just an average person and earning an average salary, how do you prepare for a comfortable retirement? The answer is by starting young or early to save a portion of your income for retirement, no matter how small the amount. For example, at age 25 you start investing RM300 every month in an investment account that gives a 9 percent annual return. You continue doing this until you are 65 years old and you will eventually have RM1.4 million in your retirement account at this stage. But what if you started at age 35 instead of age 25? A 10 years delay will reduce your retirement fund from RM1.4 million to about RM550, 000 only. What about waiting 20 years later (at age 45) to invest that RM300/month? At age 65, your retirement fund will only have the paltry amount of RM201, 000 which is not sufficient for a comfortable retirement life. Therefore, starting early is a painless way to ensure your retirement years will be active and rewarding. Your retirement planning may even begin while you are in college or university which is not a new concept nowadays as a lot of students work part-time and earning some money. So, starting to save a small amount of money at this point is entirely possible. Just remember that if your start later, you need to save a bigger amount to make up for the lost time. When you are in your 20s and have joined the workforce, continue to take responsibility for your financial future. Ideally, try to save 10 percent of your income for retirement. In the next life stages, when you are in your 30s and 40s, there is no time to waste in ensuring you are prepared for retirement. At this stage, you should have some plans set on paper (written down) about your retirement. You should have an idea how much you will need during retirement. This is the time to evaluate whether your money is invested properly and you are getting the expected returns. In addition, aim to put aside a higher percentage of your income (15 – 20 percent) towards retirement. In the final life stages, in your 50s and beyond, reassess your financial needs from time to time. Analyze your withdrawal plans and how long your money will last. Do you need to extend your working years or do you need to work part-time during retirement? 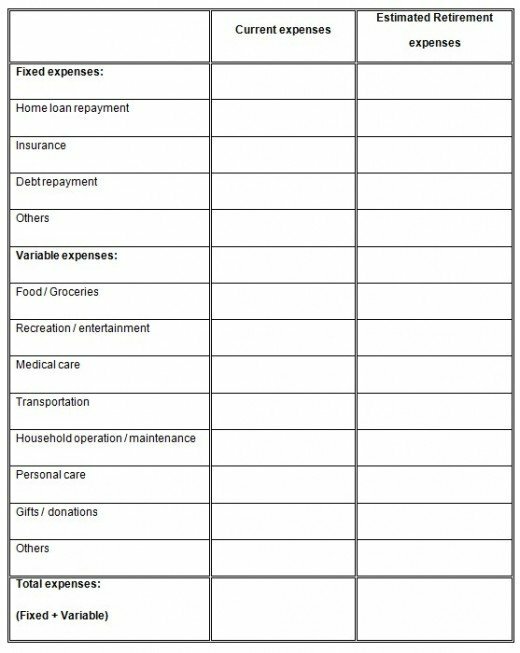 To get you started, below is a sample of a monthly expenses table comparing your present expenses and your estimated monthly retirement expenses. Fill up the table and the figures will tell you whether you are on the right track to having enough retirement fund or you need to work on it further. Your estimated retirement expenses should be much lower than your current expenses. 12 replies to "What if You Missed the First 20 Years of Saving for Retirement?" Steve, as per your question above, i think the right person that you can check about this is, probably with your remiser or unit trust agent but as friend i don’t mind sharing something here, if you got time please do a search on KLCI TRACKER FUND (Unit Trust) which is move parallel with real KL Index. I don’t dare to invest in real index (no experience & limited cash) but this will definitely in my shop list 🙂 saving up some cash. Average return its about 10% p.a for past 10 years. Good right? KL Index (Average 7%-10%) annnually. That is the reason why Rich Getting Richer…no doubt. I am not heavy investor but i know little thing that you can gain better interest/return compare to saving or fixed deposit. Here is two things that can help you boost up your saving/investing, 1st KL Index (Average 7%-10%) annnually and 2nd Propery REIT (6% – 7%) As I said, this solely depends on your risk factor. When come to any investment….there is not short cut. KC, Please correct me if am wrong. @Balamurugan, you are right that there is no investment that doesn’t require you to do anything while providing you consistent double digit return. Unit trust return also fluctuate according to the market sentiment. Just to be precise, let me rephrase my question. What investment product is available in Malaysia that can generate 9% PA Net Returns consistently? Most books on money management that I have read (and I have read many. > 100) all say the same thing with regards to compounding and the time value of money but NONE tell you how you can get consistent Net Returns year after year that is above inflation and with low risk. I doubt if there is any such product. That’s why so many people fall for and end up investing in scams like Genneva Gold and the like. But if you do have a good Investment Product, then do please share for the benefit of all the readers. You mentioned in this article, “For example, at age 25 you start investing RM300 every month in an investment account that gives a 9 percent annual return.”. Can you share which investment can generate 9% PA returns? Thanks. yes, would like to know the same. Tq. Not true. What you are stating is a general statement. There are many unit trusts which are under performing despite the fact that the Dow and the S&P 500 keep hitting new highs lately. I myself have had experienced my unit trust gaining more than 40% in 1.5 yrs. But it is a once off. Not the consistent returns that I am looking for. Are you a Public Mutual agent by the way? You certainly sound like one.